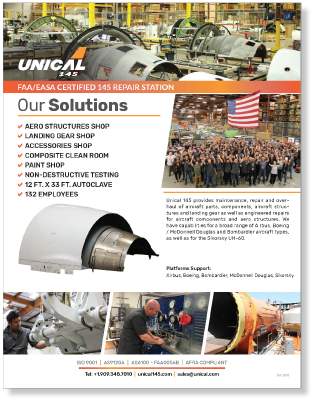 Unical 145 provides maintenance, repair and overhaul of aircraft parts, components, aircraft structures and landing gear as well as engineered repairs for aircraft components and aero structures. 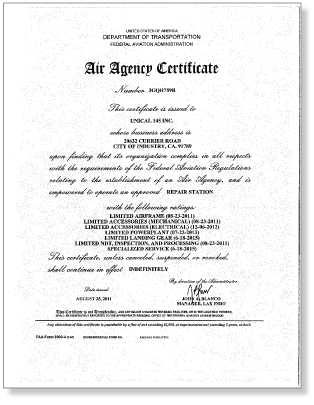 An FAA and EASA certified 145 Repair station, we have capabilities for a broad range of Airbus, Boeing / McDonnell Douglas and Bombardier aircraft types, as well as for the Sikorsky UH-60. Our Aero Structures shop handles a high volume of repair and overhaul work for nacelles, thrust reversers, cowlings, flaps and a whole host of aero structures from a wide range of commercial aircraft. We offer excellent turn around times for your aero structure repairs, an outstanding level of service and competitive pricing. 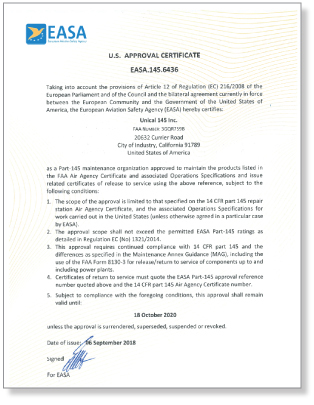 Unical 145 provides one stop shop landing gear service to commercial aircraft operators. Our facility houses all the special purpose equipment and tooling required for landing gear overhaul, allowing us to provide fast turn around times and lower cost solutions. Machining, painting, non-destructive testing and final assembly are all handled by our dedicated and knowledgeable team of mechanics.